Introduced and patented by Red Valve, the air -actuated Type A Pinch Valve offers a unique, cost-effective solution to flow control problems. 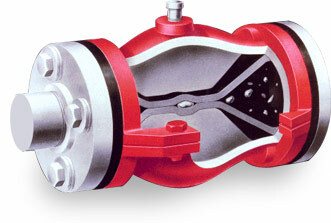 More Red Valve Type A Valves are in use than any other Pinch Valve throughout the world. The secret is in the rubber sleeve – the valve’s only wetted part. Actuation of the valve, the pinching action is accomplished by air or hydraulic pressure placed on the sleeve. The valve body acts as a built-in actuator, eliminating costly pneumatic, hydraulic, or electric actuators. Adding air pressure within the annular space between the body and the sleeve can open, throttle, or close the valve. The sleeve’s flexibility allows the valve to close “drop tight” around entrapped solids, eliminating hang ups damaging the valve itself. Sealing area is equal to 95% of the valve’s length. With Red Valve Type A Pinch Valves, there are no seats or packing to replace, or cavities or dead spots to collect debris and bind valve operation. Their abrasion resistance is unmatched. When the valve is open, it is like a straight piece of pipe in the line. Type A Valves are used on remote locations or harsh environments since there are no external links, levers, pistons, or rotating parts to cause downtime. In general, 25-35 psi over line pressure is required for full closure of Red Valve Type A Pinch Valves. Throttling control is accomplished by using a booster or proportional relay to modulate air pressure to the Type A Valve. A changing air signal through the proportional relay will modulate the Type A Valve. Designed for highly abrasive applications, the Type A Double Wall Sleeve Valve outlasts even stellated V-Ball valves and metal seated valves on abrasive slurries. To compensate for the extra sleeve thickness, the valve body is increased to the next size. Type A valves equipped with a cone sleeve are designed specifically for throttling control applications. By reducing the effective port size, the Cv of the valve can match the Cv required.